Took a one-night road trip to Rhode Island to try and attempt some sunset/sunrise images of two lighthouses there. The weather ended up providing us with some decent clouds. This is the Castle Hill Lighthouse located behind the Castle Hill Inn in Rhode Island. 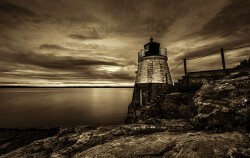 The image is a long exposure processed in sepia tones.